Sunsets of the Desert South West are notorious for casting radiant hues to the desert sky. The combination of colors found, while the sun is setting upon the desert horizon, offer perfect and natural inspiration to planning the color palette for your wedding. The inspiration for this board actually stems from the beautiful cake pictured above, which captures the essence of an Arizona sunset. The artistry is exquisite, showing a cascade of roses in rustic orange, fiery red and turquoise, against the cream base, which seems to resemble a wedding gown, as the fine details of possible pearls ring the base of each tier. What makes this cake pic a perfect example of sunsets, in the background of the image the actual sunset is reflected in the window behind the cake. The scenery of the Desert South West is a great source of inspiration as well, especially for choosing your venue. 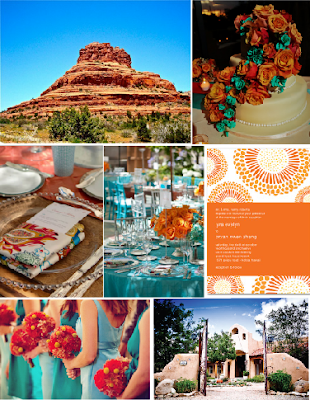 The red rocks of Sedona, Arizona, offer the most beautiful backdrop to your outdoor wedding. Hacienda inspired establishments, as pictured above, are perfect to play out the desert sunset color palette at your reception. It bodes to natural touches and rustic embellishments. The palette for this board combines the use of rustic orange and turquoise, adding in splashes of rich red and yellow, its truly beautiful and eye catching. The turquoise bridesmaid gowns, pictured above, with the beautiful red bouquets, is a stunning combination of color. Likewise the use of the tangerine roses as centerpieces to the teal covered tables creates a simple and elegant table scape. The palette would likely be used for a mid to late summer wedding, but really any time of year, especially in the South West. If South West design does not appeal to you, the colors surely might, and can be incorporated to any setting, at any location. When browsing for your color palette, focus on one item which holds the colors you want, be it a cake design, an invitation, etc., and build from there. Look to inspiration boards, like StyleMePretty.com, JuneBugWeddings.com, etc, to see weddings that used the palette you are interested in. Whatever inspires you, enjoy letting your imagination run, then seeing the inspirations turn into your reality. Its a beautiful thing to see your dreams transpired to reality.